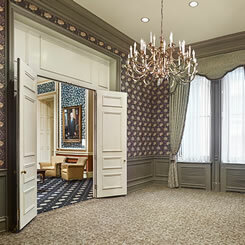 Known as the smallest room in the League house, the Binney Room was part of the original construction of the League and is housed in the "Broad Street" building. It was along with the Fell and McMichael Rooms part of the library. The Binney Room is named for one of the League's first president's Horrace Binney Jr. It became a banquet room in 1910, when the library was moved into the new building on 15th street.